How could our calendar be better? We have a very set calendar. The whole world works on it. There’s not much we can do about this now, but what if we wanted to, what if we wanted to structure it better? I got into a conversation recently, and I noted how convenient it was discussing dates in March, while in February, ’cause February is a beautiful 28 days long this year, 28 days = 4 weeks, which means that if the 11th of February is a Tuesday, the 11th of March will be one too, this can be convenient. The conversation progressed and a new calendar was born. Our current Gregorian calendar has pretty much been in place since the 1500s, based on the rotation of the Earth around the sun and some historical factors. 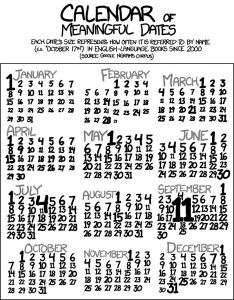 The Gregorian calendar had but a few minor alterations on the Julian calendar which had been in force since BC times. I would never suggest changing too much, start small, but don’t try break everything at once. A year is 365 days long 3/4 times, roughly. We keep the leap system, it’s a great approximation, doesn’t need any messing with and the year numbering system won’t be of any concern for us for a very long time. Months however, that’s where things start getting annoying. They’re all different lengths. But why. Some people give offhand comments to the Lunar cycles, I don’t really care. 365 is an awkward number, however, take a day off and you get 364. Know what 364 factors into nicely? 7. That’s right. How convenient is that. So my proposition is 52 weeks of 7 days with an extra day. That’s not really at all different to how we currently function though. My first goal is to take that extra day, and instead of designating it Monday or Tuesday, it will be called New Years Day. Some people will recognise it as a holiday, others not, either way, it won’t be a day in the week, it will just be a day. That way you can have the start of each year starting on the same day. 31 December is a Sunday, then we have new years day, then we have 1 January which is a Monday. But this doesn’t help that much; now we have 52 weeks. Know what 52 divides into nicely? That’s right, 4. Exactly 4 weeks per month. I propose 13 months of 4 weeks each. This means that every month, if the 1st is a Monday, the 1st of the next month will be one too. How cool is that. No more hassles about figuring out what the date of the weekend in May is, it’s the same date as the one in April. So this is easy enough, all you need is to think up the name of our new 13th month and chuck it in somewhere. One thing I’ve neglected is our balancing leap years. 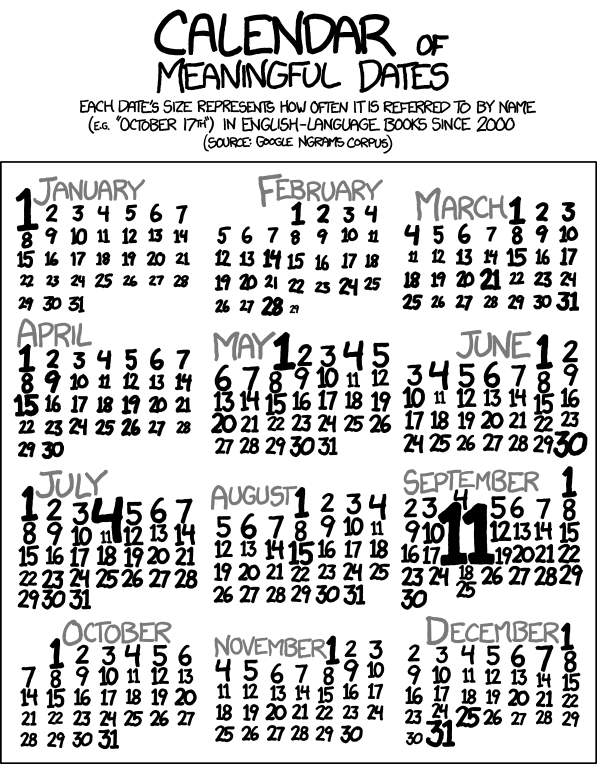 To solve this problem without stuffing up our calendars, I propose a 2nd New Year’s day. It can either be placed directly after our current New Year’s day, or we can place it at an arbitrary point in the year, where ever we want. Now as great as my idea is, it does have some downfalls/drawbacks. The biggest of which is the honouring of birthdays or other significant dates. But this isn’t too much of an issue. For most events, it’s the date itself that is important, not where it falls in the year. various countries days’ of independence, the 27th of April is the date that is important, not that it falls 117 days into the year. Events where the time of year is important, such as Easter, are anyway calculated anew each year. Year begins on New Year’s Day, which is not part of the week. The year is made up of 13 months of 28 days each. Once we get this right maybe we can get a start on decimalising time. EDIT: Apparently I’m not the first to consider this. Roman Mars of 99% Invisible did a podcast about the calendar recently discussing some of the early proposers of such a calender. Give it a listen here. This entry was posted in Opinion, Rant and tagged gregorian calendar, julian calendar, new calendar by Gareth. Bookmark the permalink. Stumbled on this while searching for info on driver’s license requirements. Interesting. Consider your blog bookmarked.